Idriss Jazairy is an experienced diplomat, international administrator and NGO leader. He has been successively Presidential Adviser under President Houari Boumedienne for 7 years and later Algeria’s Ambassador to Belgium, the USA, the Holy See, and Permanent Representative to the UN Office in Geneva. As a representative of Algeria, he was in particular a founding member of UNCTAD and the Human Rights Council. In 1984, he was elected Chief Executive of IFAD, a Rome-based UN Specialized Agency, and was later re-elected for a second term. 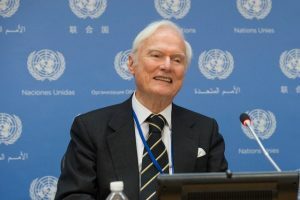 Ambassador Jazairy was the President of the Conference on Disarmament in 2009 and the President of the Council of the International Organization for Migration (IOM) in 2010. He was previously Executive Director of ACORD, an international consortium of NGOs (including Oxfam, Novib, CCFD, etc. ), then headquartered in London and devoted to the protection and empowerment of victims of poverty and civil strife in Africa. From 1995 to 1998, he was also a member of the board of CARE/USA. He is currently the Special Rapporteur of the UN Human Rights Council on unilateral coercive measures and the Executive Director of the Geneva Centre for Human Rights Advancement and Global Dialogue. Idriss Jazairy has authored or co-authored several publications, including a book entitled “The State of World Rural Poverty: An Inquiry into its Causes and Consequences” (New York University Press, 1992, 570 pages), a chapter entitled “The Role of Regional Groups and Coordinators: A Case Study – The African Group”, in Lars Müller (Ed. ), The First 365 Days of the United Nations Human Rights Council, 2007, and his most recent book “In Defence of Special Procedures of the Human Rights Council: An Alternative Narrative From the South” (Geneva Centre for Human Rights Advancement and Global Dialogue, 2015, 82 pages). He has been the Editor of several books on Human Rights and also published articles on current affairs in the international press.